shrinkage of the concrete. These types of cracks can be avoided. 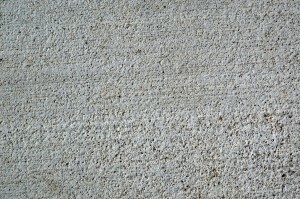 Shrinkage cracks are the result of the concrete volume decreasing as water is lost from within the concrete mixture. These cracks can still occur some months after the slab has been poured. However, the more rapid the drying process the more likely it is that shrinkage cracks will develop. The same type of cracking occurs in many other situations where moisture is lost from its structure. (eg. Clay soils will crack in times of low rainfall). In concrete slabs it is possible to reduce the width of these cracks by placing steel bars (reinforcement) in the concrete, which effectively holds the cracks together. Although shrinkage still occurs the cracks formed are closer together and are held together so tightly that they are usually too small to be visible. visible cracks, and in conjunction with joint placement, minimise those that remain. Category: Building Materials e-books Building Technology e-books Civil Engineering Articles Civil Engineering Articles for Mobile E-Books & Journals Structural Engineerig e-books Tags: causes evaluation and repair of cracks in concrete structures, Concrete Basics, concrete crack, concrete crack sealing, concrete foundation, concrete foundation crack, concrete sealing, concrete slab crack, Control concrete Cracking, Control Cracking, crack in concrete slab, cracking concrete slab, cracks in concrete slab, cracks in concrete structures, epoxy concrete, epoxy concrete repair, How To Control Cracking, need for Joints, repair techniques for concrete structures, seal concrete cracks, Shrinkage cracks, structural concrete repair, structural cracks in concrete, What Causes Concrete To Crack?